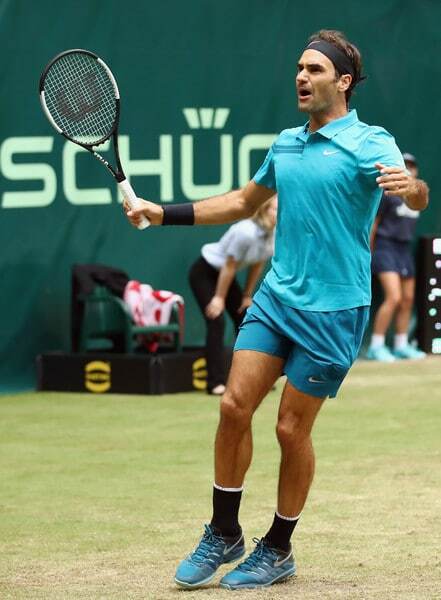 Roger Federer is into the Halle Quarter Finals after digging in to save two match points against Benoit Paire, eventually prevailing 6-3, 3-6, 7-6(7) in one hour and 59 minutes to make the last eight at the Gerry Weber Open. The Swiss had to call on his experience in the third set breaker to hold his nerve, hitting a brave full-blooded forehand from his shoelaces at 5-6 and then managing to hit an aggressive backhand on the return at 6-7 to draw an error. Pretty clutch stuff to prevail and he's kept himself in with a shot of his 10th title in North Rhine-Westphalia. Paire won the toss and elected to receive. The Frenchman won the first point with a blistering return but Roger held to thirty for a 1-0 lead. Paire was then quickly level after holding to fifteen. The two then exchanged back to back holds and in game seven it was Paire who held the first break points of the match thanks to a sweet lob. Three big serves got Roger out of trouble though and he was able to break in the next game for 5-3 as Paire's frustration boiled over, throwing his racquet around after a string of missed first serves. Roger served it out 6-3 with a minimum of fuss. Into set two and with Paire still seething it looked like Fed would put the match to bed at 0-30 and 30-40 but Paire somehow got out of the game. That gave him some real impetus and he went onto break the Federer serve twice in succession for a 4-0 lead. The Swiss was able to recoup one break but he couldn't restore parity as Paire closed it out 6-3. 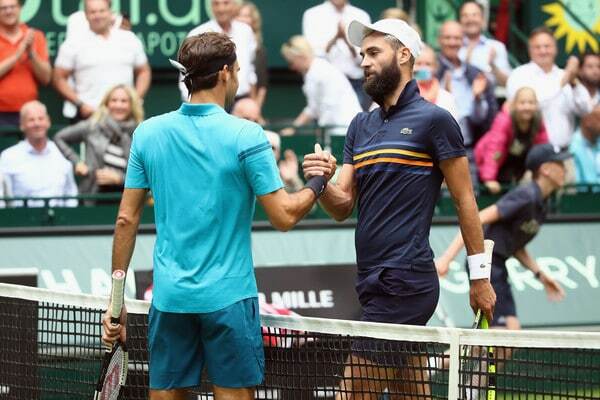 Federer served first in the decider, holding to love for 1-0 and immediately had a half chance at 0-30 but some tentative returning allowed Paire to hold. The next four service games were held for the loss of just two return points but in game seven things began to open up; with Roger getting pegged to deuce and then fashioning a breakpoint on the Paire serve in game eight which he couldn't convert. A love hold followed to put the pressure straight back on Paire and two games later it looked it might tell as the Frenchman slipped to 15-40, only to find some big serves to hold and force a tie-break. Into the breaker and Roger soon forged a 3-1 lead but Paire fought back, winning four points in a row to gain the advantage and he held match points at 6-5 and 7-6 only to see Roger erase them with some brave play which had the crowd gasping before he finally closed it out 9-7 in the third. A very close match this one that could quite easily have gone the way of the Frenchman had he managed to find a first serve on match point. But he didn't and his forehand let him down when he needed it most as Roger played with enough conviction on the match points to erase them. Next up is Matthew Ebden who I had a feeling would do well here given the number of matches he's already played on grass this year and his come forward style causing problems as it's rarely seen on tour. I saw a bit of his match vs. Chardy in Rosmalen and he was impressive, pretty weak serve but that actually gives him more time to close the net where he's very effective. The Aussie saw off Kohlschreiber in three sets today and he'll be bringing plenty serve & volley to the court tomorrow so it should be fun to watch. It could also be a tough match too depending on how sharp Roger is. He'll need to be moving well to make sure he's there in time to make those passing shots difficult as Ebden has decent hands. Historically Fed has done a pretty good job at rushing players who are supposed to be the ones doing the rushing so I think he'll prevail, all about keeping focus for those openings against a net rusher. Hopefully, he comes through in 2 sets. What did you guys think of Federer's performance today? Predictions for tomorrow? Let me know in the comments. Tight match after Roger seemed to breeze the first set but Paire played some good stuff and mixed up his pace nicely to devoid Fed of any rhythm. Touch and go at one stage but he was clutch enough in the breaker to get it done. Don’t think my nails will stand more matches like that! Roger’s never played Ebden before, has he? 1st Round at the Crucible a few years back. Fed hit a 147. Reminds me of a dude called Simon Sinek(founder of the golden circle) His theory on champions mentality, everytime you ask them if they’re nervous ,they say they were excited. He adds that physiologically Being nervous/anxious or exciting has the same effect on the body. Guess I am surprised Roger used the word exciting. Lucky Paire has a joke forehand, otherwise it might have gotten even more ‘exciting’. Anyone worried about Fed getting over cooked for Wimby? Since early 2017 he’s about 2 tournaments to the good and then has either a weariness let down/ injury and / or takes a clay break. I’d be happy for a secret tank tomrorrow to keep himself fresh for wimby. Not worried at all. It’ll take a pretty off Fed to lose in the first week at Wimbledon and there is a week off between the final and the start of Wimby. Since his glorious “old man” return in 2017, He’s pretty much been good for winning 2 tournaments in a row and then it’s a weariness-crash or some injury or the clay break. If he wins Halle and Stutt he’ll have had his 2 tournament run. Winning 3 in a row would be a first in a long long time and certainly since before his return from 2016. He’s almost 37. Just don’t want him weary for Wimby. For the second time in the week the match will be played with only one vowel on the court. Thet es vere ewkwerd, endeed. Well,I think so many of these players who fancy their chances bring it to Fed and loose in the next round. Do you all agree with me when I say that the “old federer” before 2017 would have lost this matches but the new one often finds away to some kind of slugg him to a win. He doesnt always play great but he find a way to win. It was the same last year in a couple of masters where he saved match points. God knows who Spon is. Paire couldn’t find the first serve twice on matchtpoint.But that is why Fed is Fed and Paire is Paire. Apologies to all for mad random posts. Now who is the Edgen Guy?Does anyone know anything about him? Serve and volleyer on grass. Hi haven’t posted for a while but have been following. Was very tense match. That’s quite an admission for RF to make ‘wouldn’t be such a bad thing to lose’ cos I’m sure as soon as you get in that frame of mind you do. Don’t think it helps him particularly that draw has cleared at such an early stage. erratic and can choke(thank God)on big points. Now Ebden.Have they played on grass? None of these people would have a chance over 5 sets but over 3 rather different. Paire is one of the most enigmatic players on tour. I try to never miss an opportunity to watch him. He has easy, clean and powerful strokes… You just don’t know when they’ll show up, just as you never know when his mind decides to take a trip somewhere else, possibly several time zones away. He’s thinking about Wimbledon and being well prepped/ rested. Ebden,I feel ,oh err!But this Fed okay. Yes he has talent but not consistency,thank goodness,from a rather selfish point of view. Watched the Aussie take out the German in style, a lot of serve-and-volleys, reliable serves and effective returns. Looks like a pretty good player on grass. Let’s hope Roger can maintain his cool, feel good mentally and physically. “Hitting a brave full-blooded forehand from his shoelaces” – best one yet J. Such great comments here from everyone. Yes, we are a bunch of mother hens when it comes to Roger. Has he played too much, not enough, injured?, a cold?, the kids kept him up…..
Nail bitter of a match. I didn’t think he was going to pull that one off at all. I agree Markus, he has found a way to win many times of late when seems all is lost. Ebden has played a lot on the challenger tour. Hopefully, that was Fed’s “bad” match of the tournament. We expect a lot from the guy, so true. Ebden probably played the most matches on grass this year of anyone, Surbiton, Rosmalen and now Halle. Omg. Thank goodness, in retrospect, I couldn’t watch the scores live – could have done myself a serious injury. “Roger doesn’t play tennis in a vaccuum” – good point and timely reminder, Jonathan. The h2h is so skewed we forget Paire actually has moments of brilliance, and if they happen to coincide with a Fed…. lull, watch out. I think Ebden may be another one with moments of brilliance – hopefully Fed is done with his lull. Ebden deffo going to ask Fed questions and make him come up with the pass. I think if Fed returns aggressively then he going to be fine, get Ebden volleying off his laces. Goodness what a nailbiting match, not sure my heart can take it. Its just too much. Not sure I cant handle such epic match at wimby. I hope for an easier match against Ebden. And did you guys see NK at Queens. He is yelling at his team like a maniac…f..ing this and f..ing that. Looked like he expected them to cheer and inspire him 24/7. Otherwise, no idea what his problem is. Poor mom, why does she put up with that. Talented for sure. But is Kyrgios a natural athlete? I’m not sure, look how fat he was a few years ago on pics. I think he has worked very hard to get in pretty good shape. But his frame is quite fragile judging by his injuries. Watched the entire match until 3/5 in the tie-break when I really needed to go plus I couldn’t watch anymore. If I can borrow a phrase from my native tongue to express my feelings at that moment: Roger has dug out our souls with a tea spoon. I was thinking “If you’re bound to lose, just lose and that’s it. Why do we have to go the distance just to see it happen”. I felt Roger was lagging. Like he didn’t drink his coffee in the morning or just had a different sense of time where everything moves faster than it really does. In the 1st set he got a new racquet from the bag and it slipped right out of his hands. He lost the ball when bouncing it before serve a couple of times, and I think that in the second set it actually roled out of his reach and he had to ask the ball boy for a new one. I think that in the eighth game of the match he totally mistimed a overhead, believing he could reach a lob when he wasn’t close at all. Overall he played very tentative, too many slices, and he gave Paire a lot of opportunities to attack, some were capitalized but luckily not all. The match was with little pace, and I felt that many of Roger’s shot hung up in the air for a long time, giving Paire as much time as needed to crack a winner or draw an error. The only things that saved Roger are his service game in the first set that was very solid and his guts in the end. A steadier opponent would have taken the match. In a solid day Roger shouldn’t drop a set against Paire. His first two service games in the beginning of the second set were the worst I’ve seen from him in a while. It all joins my feeling that this year Roger isn’t as fresh as he was in the same time last year. It actually started from the Rogers Cup. I think that another year of age, the burden of expectations that wasn’t there when he just came back and a busy schedule besides tennis take their toll. This was the sixth match in eight days and it showed. I hope he finds more energy in him to take this one. The only big rival Roger has in this draw is himself. No disrespect to Paire (or to your tennis skills), but I though Roger made it too easy for him in many rallies. He had some brilliant shots and mixed things nicely, but Roger just served bad in the beginning of the second set. He opened the door and Paire got in. So you can give him credit, no doubt, but it seemed that today’s match, since the second set, was on Paire’s racquet and he just didn’t close it out. Like Roger said after the US open that he felt the outcome depends more on the opponent and less on him. It was that kind of match. Don’t ever do this me again, Roger! I really have my doubts that he can sustain a high level throughout the three grass events. I wouldn’t mind he lost here and rest up for Wimby, except his draw has opened up and he really has no excuse not to win his 99th here. I don’t know. I guess he and his team know better and I’m sure they have a plan. Please, nothing comes at the cost of his #9 at the most prestigious tennis event. Ikke bekymre deg. Fed has a week off after Halle, should be fine. He can’t start tanking matches just for Wimbledon, I think it would be bad psychologically. He has already scheduled smart with goals in mind. Two tight sets, being broken twice and couldn’t find serve rhythm. Roger looked a bit tired. Hmm, Roger developing a slightly worrying tendency to drop multiple serves in the second set?